Japan PostgreSQL Users Group will be having an annual 1day technical conference, PostgreSQL Conference 2012, on February 24 in Tokyo. 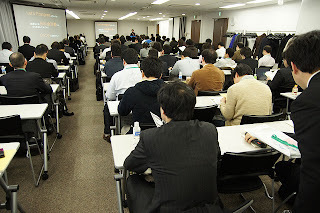 There will be two keynote sessions and 13 sessions on PostgreSQL. The opening keynote is "How a large organization moved its critical application toward PostgreSQL" by Philippe Beaudoin from Bull, France. Migrating a large database in the public sector is always interesting topic for open source communities. I'm very interested in this keynote. The second keynote is "An Overview of PostgreSQL 9.2" by Robert Haas from EnterpriseDB, the United States. I have already known a few enhancements in 9.2, but it's hard to catch up with all of the discussions in pgsql-hackers, so I'm looking forward to hearing about that. Also, the conference will have three tracks: Technical track, Migration track, and Tutorial track. The Technical track will have 5 sessions. The Migration track will have 4 sessions. Finally, the Tutorial track will have 4 sessions, including my talk. Training new DBA with "The OSS-DB Standard Textbook"
There are lots of interesting sessions in the conference, so I'm looking forward to attending the conference and seeing pg guys there! 2.Edited recovery.conf on the standby. After putting the recovery.confg in data folder,I cant start the postgresql service. Could you send me the question via e-mail? Please send e-mail to snaga _at_ uptime _dot_ jp. Or pgsql-general would be more helpful for you, because there're many pg guys familiar with Windows.